2. 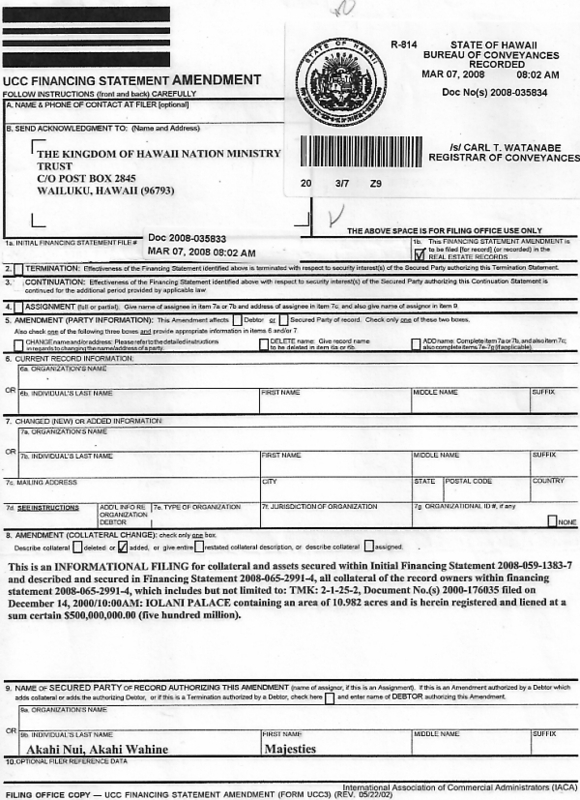 THAT, Respondent, LINDA LINGLE, is herein addressed in her private capacity, and in her public capacity as Acting GOVERNOR, and is participating in a commercial enterprise with her co-business partners, including but not limited to State of HAWAII, hereinafter collectively referred to as "Respondent." 4. 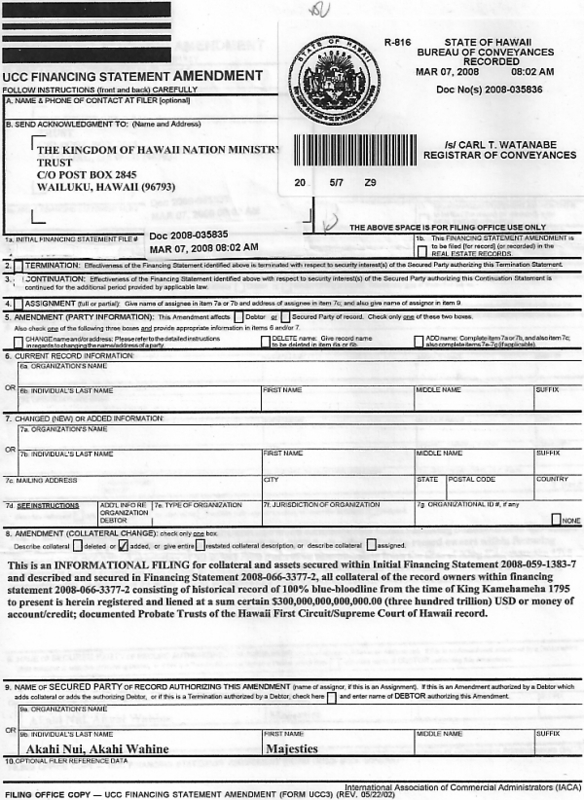 THAT, on August 13, 2008, Affiant's had delivered a PRIVATE ADMINISTRATIVE PROCESS called a, CONDITIONAL ACCEPTANCE FOR VALUE FOR PROOF OF CLAIM (CAFV) (document for discovery) via Personal Delivery to the Respondent requesting proof of claim and evidence as to the validity of an inferior CLAIM OF TITLE(s), COURT ORDER(s), FULL DISCLOSURE WITHIN CONTRACTS, LINGES AUTHORITY OVER HAWAIIAN LANDS PROPERTY AND INTEREST AND OFFICIAL/PERSONAL MISCONDUCT; Respondent has given and granted property (real and tangible) within the Hawaiian Islands without authority to do so, she has signed and acted on behalf of the sovereign people within the Hawaiian Islands without authority to do so, she has requested and condoned monies to be transferred and given out of the King Kamehameha and other Trust's, she has blatantly ignored the fact that there is a 100% Blue Blood Lineal Sovereign Heir to the Kingdom of Hawaii, who was coroneted at the Iolani Palace on February 22, 1998, She has fraudulently presided over the Hawaiian Islands and all that it contains, she has supported and ruled in favor of many quit claim deeds and title transfers knowing the absents of lawful and clear title, said transactions include but are not limited to ALEXANDER & BALDWIN INC (A&B), DEPARTMENT OF LAND AND NATURALS, LINDA LINGLE DID act and continues to act in haste and error WITHOUT doing the proper research or looking at the facts in this situation and/or the present state the STATE OF HAWAII finds itself in. 5. 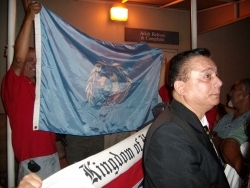 THAT, due to Respondents non-response, dishonor and the rule of acquiescence, YOU Ms. Lingle, are now in full agreement, that the STATE OF HAWAII, DEPARTMENT OF LAND AND NATURALS, ALEXANDER AND BALDWIN (A&B) YOU- YOURSELF holds NO TRUE and LAWFUL TITLE to property and/or land on any of the Hawaiian Islands. That all Order's, contracts and actions pertaining to yourself, Linda Lingle, STATE OF HAWAII, DEPARTMENT OF LAND AND NATURALS, ALEXANDER & BALDWIN (A&B) and any other entity, without consent from Majesty Akahi Nui, exchanging and transferring Land Titles etc., have been unconscionable and based on FRAUD with fraudulent pretenses. 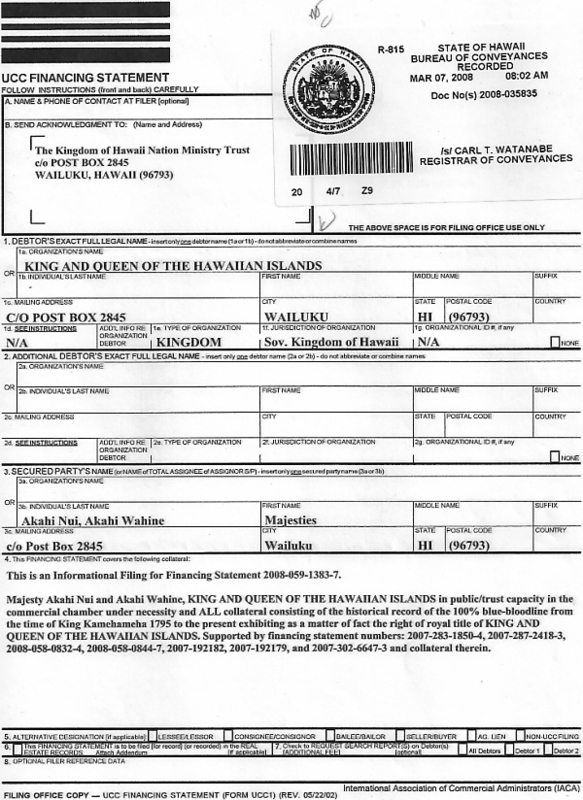 And that LINDA LINGLE along with A&B and others have failed to give full disclosure within their claim of True and Lawful Title which includes other matters in regards to request for Proof of Claim, and for other various proofs of claim to support any valid lawful claim, Title or otherwise which includes but is not limited to the Iolani Palace and other property and lands within the Hawaiian Islands. 6. THAT, the negligent actions taken by LINDA LINGLE explained above and the reckless wanton actions LINDA LINGLE continues to perform and continues to execute and enforce orders without standing or authority to do so over the people within the Kingdom of Hawaii Nation, over land, property and soil within the Kingdom of Hawaii nation and by such causing trespassing, unlawful arrest, incarceration etc., you are now in agreement those actions were based on deception and fraud causing personal and commercial injury and damages to the Kingdom of Hawaii Nation Ministry Trust, Trustee's, The Kingdom of Hawaii Nation, it's King and Queen and their people. 7. THAT, Respondent had 7 days to respond, plus 72 hours with an opportunity to cure default, with proof of claim, point for point, however elected to remain silent or otherwise refused to provide said proof(s) of claim and therefore has failed to state a claim upon which relief can be granted and has agreed and stipulated to the facts that they operate in favor of the undersigned. 8. THAT, Linda Lingle, through your dishonor and default you have admitted and confessed to your own fraudulent and unconscionable actions as well as those of ALEXANDER & BALDWIN, and THE STATE OF HAWAII who you've acted on behalf of. And by your dishonor and default, you, Linda Lingle as acting Governor agreed that THE STATE OF HAWAII, ALEXANDER & BALDWIN (A&B),DEPARTMENT OF LAND AND NATURALS along with yourself does not hold and posses any lawful title(s) and are not the 'Holder in Due Course' of lawful superior title(s) within the Hawaiian Islands as found within and constitutes the Sovereign Kingdom of Hawaii Nation and you have agreed and have given permission for a lien to be filed against yourself, The STATE OF HAWAII and ALEXANDER & BALDWIN (A&B) for said fraud, injury, default and dishonor for damages incurred upon The Kingdom of Hawaii Nation Ministry Trust and the Trustees, the Kingdom of Hawaii Nation, its King and Queen and their people; not withstanding Judge Douglas Ige, Richard Priest Jr., Mr. Patrick Sniffen, Gary Guenther and Jason Koga for their negligent actions, adding & abetting and commercial/personal damages towards Majesty Akahi Nui and the Kingdom of Hawaii Nation Ministry Trust and Trustees who DO hold lawful pure Allodial title to the sovereign property of the Kingdom of Hawaii. 9. 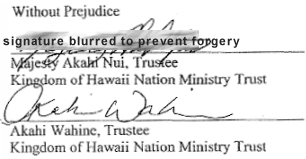 THAT, Respondent also agrees and confirms that ALL land and soil within the Hawaiian Islands, The Kingdom of Hawaii Nation, including but not limited to the land parcel addressed as 9 Firebreak Road in Kahului, Hawaii IS HELD IN TRUST by The Kingdom of Hawaii Nation Ministry Trust and Douglas H. Ige, who granted order, in behalf of A&B, has agreed that The Kingdom of Hawaii Nation Ministry Trust HAS True and Lawful Title to said property and as such HAS Right of Possession, which VOIDS A&B's claim, inferior title and Writ of Possession. AND said True and Lawful Title to property also includes the Iolani Palace on the Island of Oahu. which includes other matters in regards to request for Proof of Claim, and for other various proofs of claim to support any valid lawful claim, Title or otherwise. 11. THAT, Respondent has dishonored Affiant's CAFV by not providing Proof of Claim(s) in respect to the above. Respondent failed to contest acceptance of the CAFV and this dishonor is now deemed a charge against the Respondent. 12. THAT, therefore, this matter is settled via stipulation, agreement and confession of the party(ies) and is the private agreement of the parties and all documents within this matter being notarized became Judicial findings of fact(s) and res Judicata in this matter, settled at law, i.e., a commercial (dishonor) private default Judgment. Dated this 29th day of August, 2008. SUBCRIBED TO AND SWORN before me this 29th day of August, A.D. 2008, a Notary, that Majesty Akahi Nui and Akahi Wahine, personally appeared and known to me to be the man and woman whose names subscribed to the within instrument and acknowledged to be the same.